I am less than a newbie in this subject; therefore i am not able to distinguish an armet from a close helmet, despite my efforts to figure it out, from what i read about this. 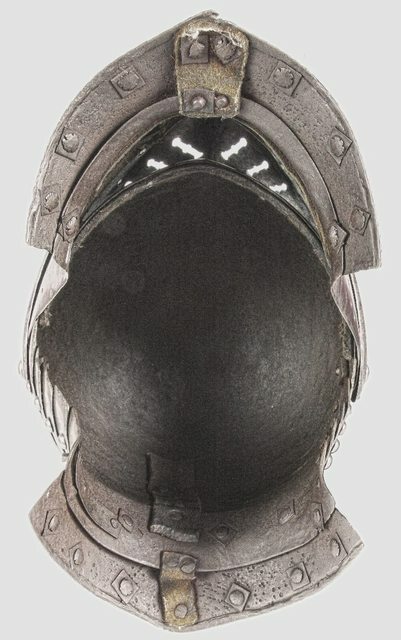 If i am to consider that the main difference between both is the bevor, in that the armet splits in the middle, the two halves opening outwards, whereas in a close helmet the bevor is in one piece and shares the same pivot point with the visor, opening by swinging upwards, i face a dilemma. In the attached example, i was told that it is an armet, while its bevor is an entire piece and rotates upwards like a close helmet is supposed to be. Is it that this is an exception to the rule, taking into consideration other parts, like the one piece visor, or the articulated neck lames... meaning that this would be a composite, and not a true either style ? No comments, anyone ... please ? Thanks for your note, Greg. Please do be aware that the pace and speed of response on this forum is not the same as a forum devoted to a topic like politics. Responses sometimes take several days. I am not an expert on this topic. My comments are mostly based upon the video posted by Ian LaSpina, which can be viewed here: https://www.youtube.com/watch?v=42oEPWVGNBw. My first question is which image are you referring to in your question? You seem to have included pictures of three if not four different helmets. The image that displays first looks to be of a very crude helmet. The style and feel reminds me of a clumsy 20th century reproduction that might be meant simply to be a faux-suit of armour used as decor. The next image looks like it may actually be a photograph of a genuine helmet. 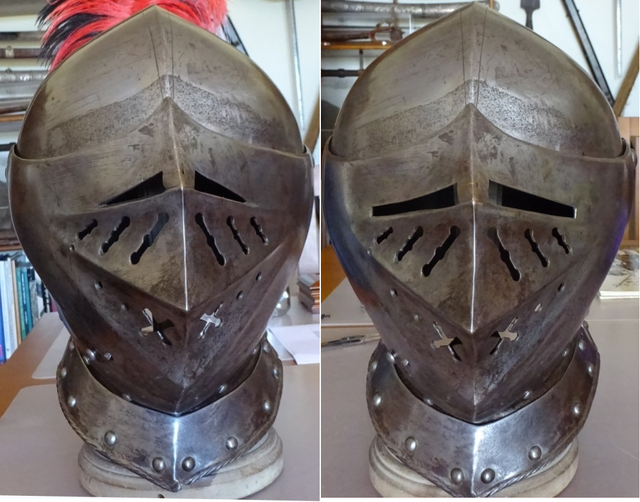 The third image may also be a real helmet—I can't say for sure—but the bronze or brass work shows that it is not the same as the first two helmets. 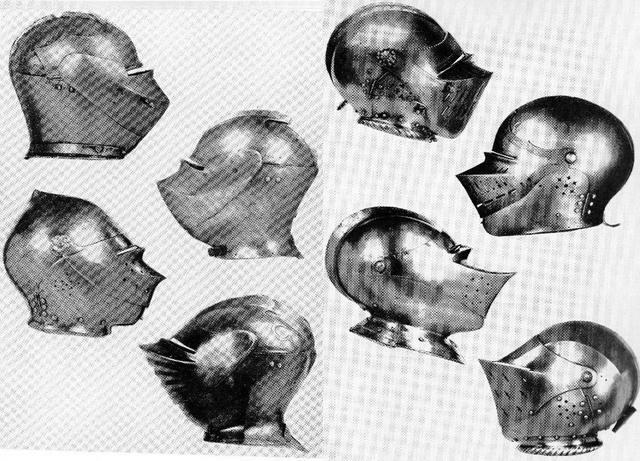 The last helmet is fairly obviously a modern reproduction. So, the question is, which of these helmets are you asking about? 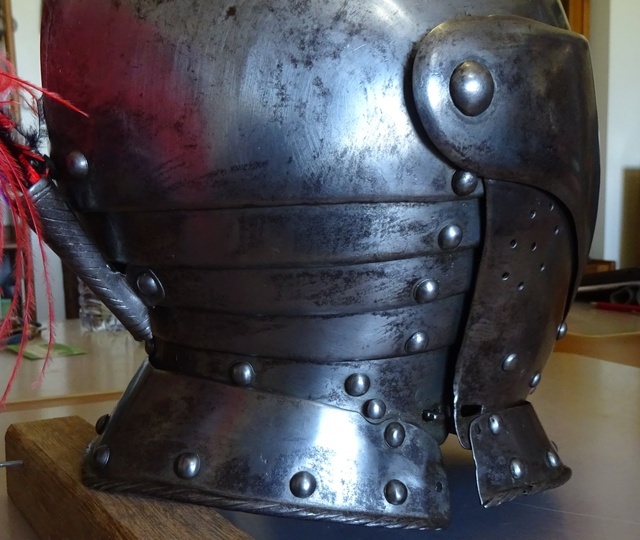 Coming back to your question more directly, Ian LaSpina indicates that close helmets and armets very often share numerous similarities in design and style. 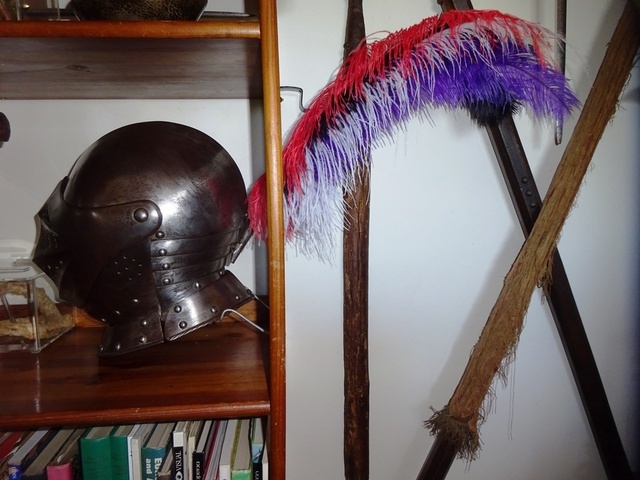 The only essential difference is the method of opening the helmet to put it on the head, with the plates moving forward in the case of a close helmet, and sideways in the case of an armet. Thus, if the helmet rotates upwards, it is a close helmet. If the person called it an armet, they've made a misidentification from a modern standpoint. 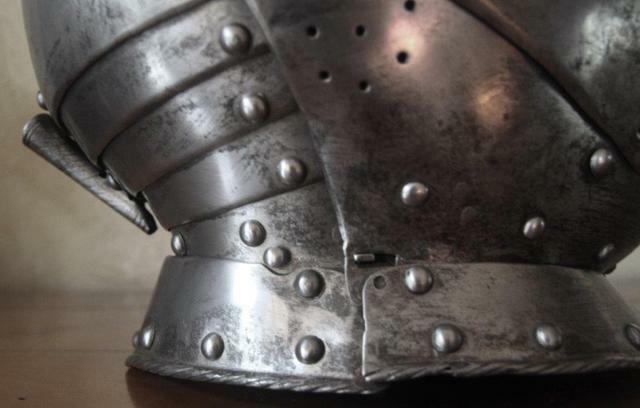 From a period standpoint, both helmet types were called "armets", so the distinction between "close helmet" and "armet" is a modern one meant for additional precision. I appreciate and thank you for your input, which takes me to raise a point to some of your notes, other than those on the helmet identification. Firstly, i wouldn't know how fast responses from fora devoted to politics are, as indeed the only forum i usually frequent is one of antique European weapons, where eventually i am a humble moderator. My modest experience leads me to realize that, the speed in responding to topics, is more in accordance with the subject in question than that of them being posted in diverse fora. I am amazed how you point out the difference in the uploaded pictures. Let me assure you that they are all of one only helmet; only that taken in different contexts; some taken by the person i bought it from, those most probably saved from the previous seller and others taken by himself, in principle with a different resolution. As for the last picture, such was taken by myself, and the only thing modern in it are the recently acquired ostrich plumes, an idea i caught from lurking on the subject in this very forum. AAMOF, i have preciously watched (more than once) the LaSpina clip. 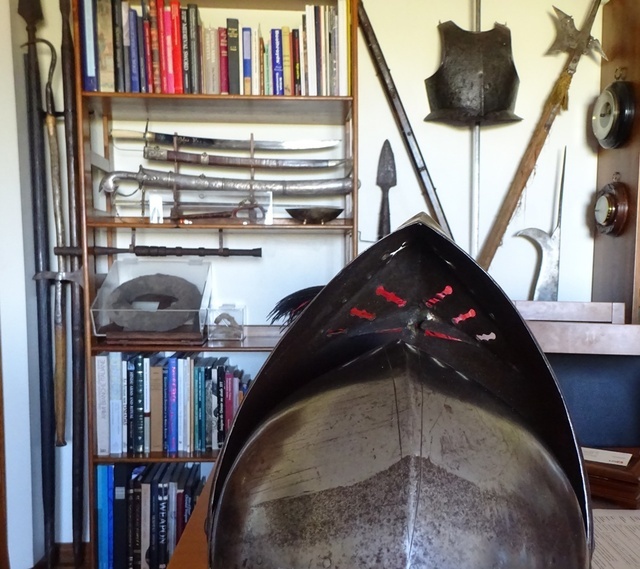 However i have attempted to make it clear in my original post that i was giving the armet versus close helmet concept the benefit of the doubt, attending to some atypical details in typology. 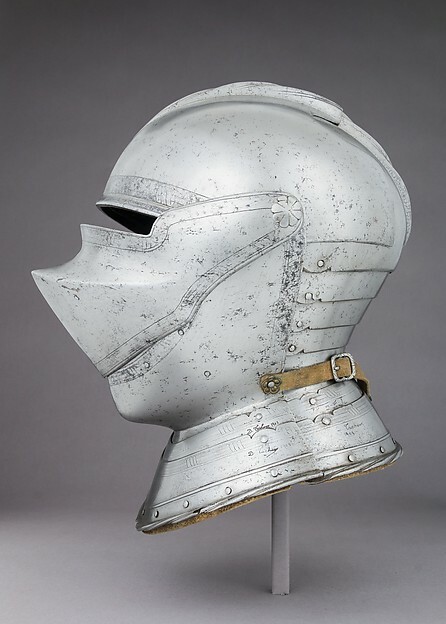 I would pretend that, the person that identified this example as an armet, is no less knowledgeable in this subject; as i wouldn't doubt his competence neither that of LaSpina and other fellow members in this forum, i was trying to position the different perspectives. 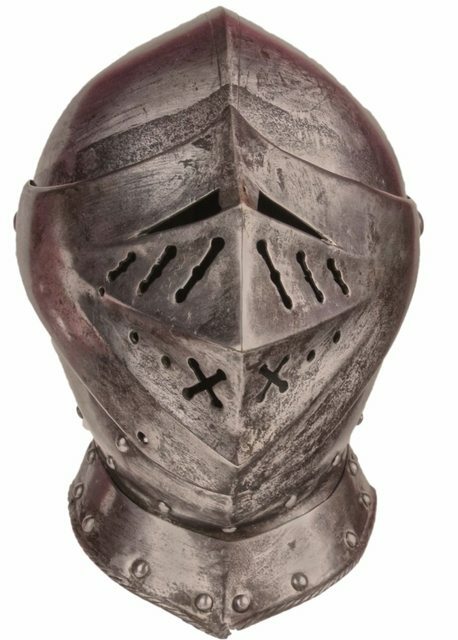 But after all, you Craig have actually enlightened me, by attesting that, being called a "armet" or a "close helmet" depends basically on a period standpoint. Judging by the assumption made by the said person that this would be an end XVI century example, that figures. Much obliged for your thoughts and all the best. Wow! That is a truly interesting and rare piece, despite the ridiculous 'restored' (probably 'Victorian' visor). Oh, and the gorget lames look as though they have been scrounged from something else. Flemish, I reckon, fairly early 16th century looking at the laminated back of the skull, and the crest. You can see what the real visor's outline was by looking at the corrosion shadow on the skull. 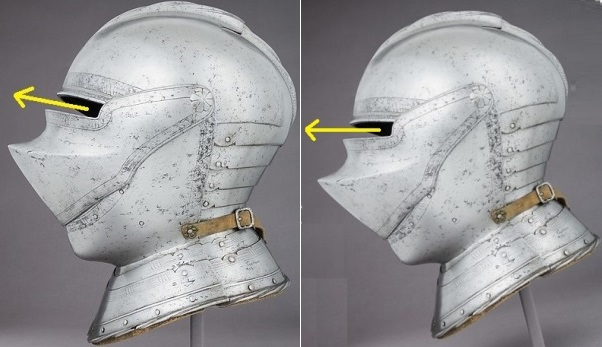 The English scholars use 'close helm' for those with lower bevors that pivot at the same points as the visor, and 'armet' for those that have hinges holding on cheek plates that overlap at the chin. The French call them all armets, from what I understand, so that could confuse someone living in Portugal. In form this is a closed helm for the reasons you describe: the components all pivot around common points to enclose the head. There are other things to note about this helmet. If there is anything original, it takes a little study to imagine what those parts might be. It's all loose speculation until one can examine it closely. I haven't looked through my library, but I offer the following first impression for the sake of discussion. 1. As mentioned the visor is not only aesthetically criminal, it is a poor replica because one's vision is unnecessarily restricted by the awkward, narrow vision slits. The sights are sloped in a fashion seen often on Victorian replicas. This visor is a very poor representation of something vaguely early 16th century. 2. The corrosion on the frontal skull suggests a relationship with a visor different from the one it has now. 3. The back of the skull looks like a burgonet from the 1530's or later. The articulated occipital portion of the skull doesn't seem to me to be consistent with the rest of the helm. A burgonet would have hinged cheek pieces below a pivoted brim. 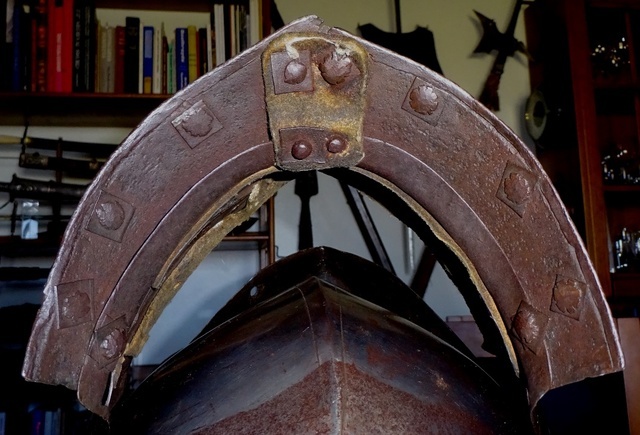 It's possible if original that the hinged portion was trimmed off to make this close helm. Later 16th century burgonets often had no crest. This helmet lacks a crest as well. However, the bevor portion of this helmet looks to be in keeping with the skull in form and shows consistent corrosion where the visor sat. I'll have to look into more historical examples before I can develop a strong opinion. 4. The lowest lame of the collar transitions awkwardly at the intermediate neck lame. If and original piece, I would suspect it was reshaped. The pointy terminations of the lowest lame are atypical at best. The view from underneath shows gapping and interrupted leathers. There is more to study and say about this helmet, even from photos. This is all I have time for right now. Here is an early close helmet from 1500 in the Metropolitan Museum of Art. I would never have thought there were articulated skulls on helmets as early as this fine example. Articulated lames that pivot low on the hem are common on helmets in the "maximilian" style from the first quarter of the century, but this is quite different. compare multiple views with the example in the original post (more views here: https://www.metmuseum.org/art/collection/search/27141?sortBy=Relevance&amp;what=Armets&amp;ft=*&amp;offset=0&amp;rpp=20&amp;pos=15). I'd need better views from the OP to compare front and side profiles. In the meantime it will be interesting to continue looking for examples of this type of construction. Thank you guys for the new approaches, rather different from the previously one presented ... i mean in tone . I should say i am only trying to dissect the term used to define this helmet, as far as typologic or even lexical semantics may extend to, but definitely wish not to open a Pandora box. I can easily sustain definitions like that one of James, in his "ridiculous restored Victorian visor" gallant diagnosis, and his keen attribution of a Flemish provenance and all. The only pertinent remark i digest is the one in that "the real visor's outline was denounced by the corrosion shadow on the skull. 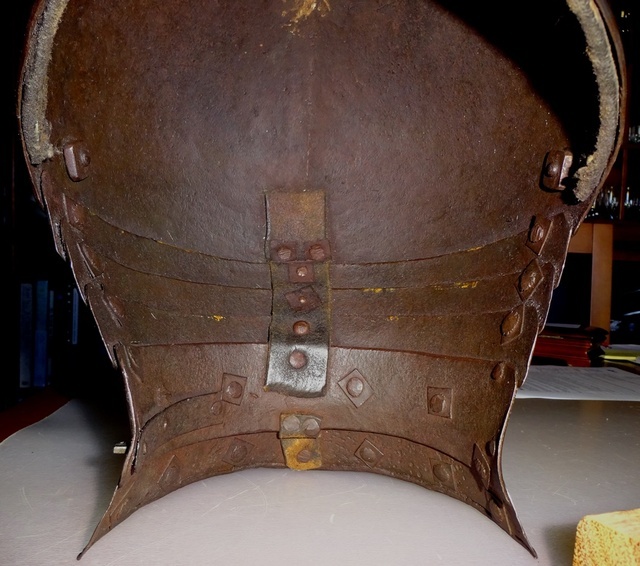 Well, corrosion is somehow a strong term, but still i can understand, even considering that the 'pasting' of different parts during field helmets life was not necessarily criminal but a course of their life, to what i have learnt. Whether the French used the term Armet as a generic, and Spanish called it Elmete, so as (possibly) did the Portuguese, is something i still have to discern, but let it be a confusion that i can live with ... until some soul comes with a serious lecture. I thank you Adair for your constructive input i will try and take pictures from different angles. And recalling the saying "so many minds so many wits", at this point i can't resist copying here the comments that attracted my whiling to learn the strict definition of armet term ... made by an American, not a French . "This one is a very interesting combination of elements. The articulating neck lames following the slope of the back of the head are something i'm more used to seeing on casquettel burgeonets like this ... 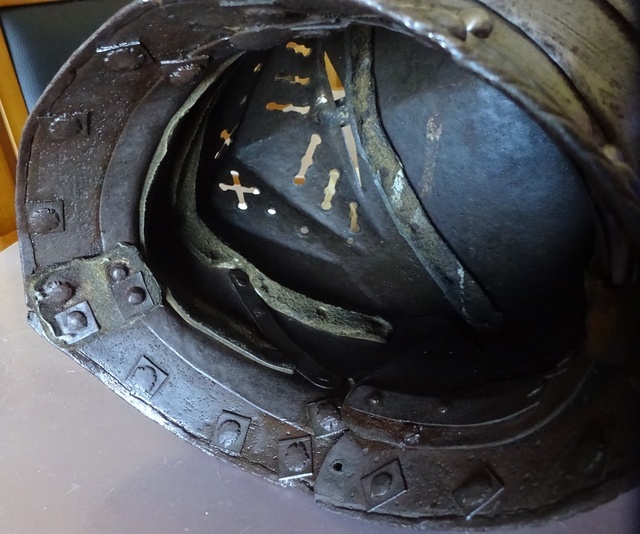 The side key slot closures for the front and back halves rather than the more often seen sneck hooks is interesting and the single piece visor in the manner of an armet ( this seems to be a late 16th century armet helmet to me ). There are things I like to see, hand cut washers, the open holes in the lowest lames of the neck front and back are tapered indicating that they were punched and then ground back as they should be. 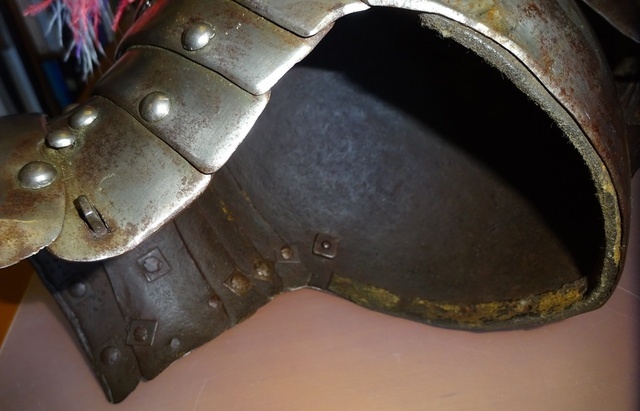 The bottom front and back neck lames may have been reused from another helmet due to the open holes but they may also be original to the helmet as mislocated holes is hardly uncommon in period armour. 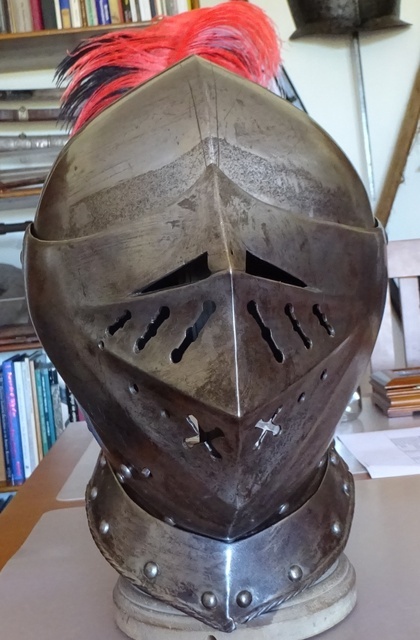 This helmet " feels " legitimate to me, whether built from some older parts ( this was not uncommon in 16th an 17th century munitions and mid level armour ) it seems to me to be original based on the pics and the construction details I can make out from them. " I have taken a new set of pictures; so mediocre as per my limited capacities, and shrunk by Photobucket and all. Concerning the narrow vision slits i, a non initiated collector of these things, having thought of visors used in jousts, where one wonders how knights could see ahead without a periscope, realized this was a 'normal' device. Besides, having checked on several helmets exhibited out there, museum catalogs and all, i have my (ignorant) doubts of how they position them for picture taking, that is, showing them geometrically upright and not as if they were on the persons correct head position. My adopted test was the plume holder angle as a point of reference; plumes ought to stick above the helmet skull, not behind them; this also in accordance with the visor slits being in a visual horizontal manner. Suddenly some slits gained a much better vision opening space. All this to say that the visioning in my example is not so blind as i first thought; notwithstanding this visor being a later arrangement, as you observe with all property. Concerning the 'corroded' part on the skull front suggesting/determining that a different (higher) visor equipped this helmet, again my ignorance; i took it that this present visor stood partly open for a long while, causing the pitting of the hidden part. Today i tried to reduce such marking a little, with only partial success. Thank you so much for your patience... Fernando. Fernando, I am not a collector like many of the people here, but I am also suspicious of the visor with its triangular, slanted sights (viste). Looking at the inside, I am suspicious of the 'bubbles' on the bottom lame at the throat and the back of the neck. 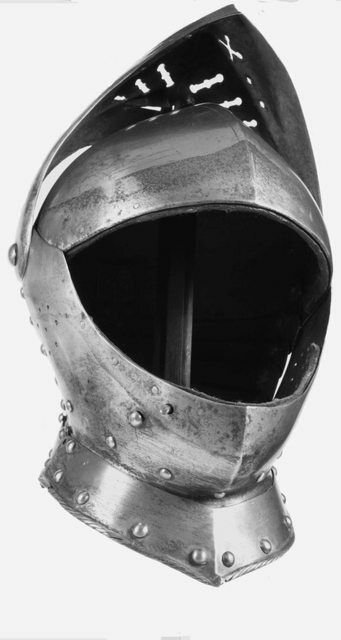 I have been looking at some sources, and I have a suspicion that in the 16th century, both what English scholars call "armets" and what English scholars call "close-helms" were called "helmets" in English. So I would not worry too much about names. Good books like Claude Blair's or Matthew Goll's define their terms and then follow that definition. I've scoured my library and not found any helmet quite like this. 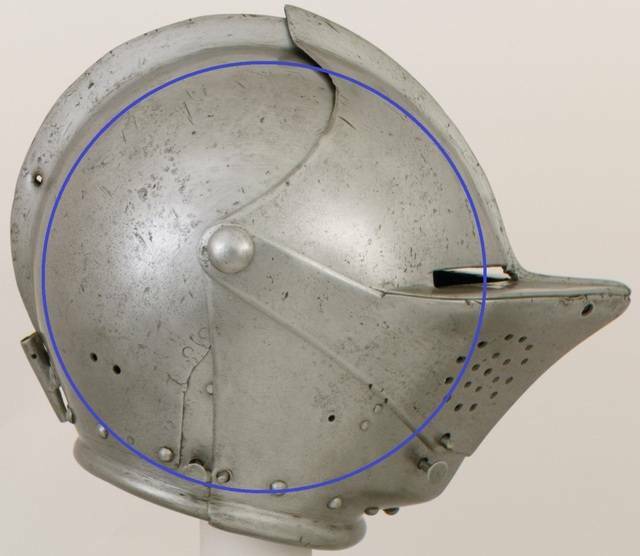 There are Italian casques of the early 16th century that have a similar articulations, but they invariably have a brim visor. The bevor portion of this helmet appears to match the skull in every detail so I don't know what to make of it. I'd like to point out one more thing that troubles me about this helmet. The parietal portion of the skull is not very full. It suffers from what many modern reproductions do: the shape is too round, too blunt. I put together the attached image to describe what I mean. I used my head profile, and my head is rather elongated compared to some, but it serves the purpose of discussion. When I align and scale the helmet based on the face and neck openings, the skull shape is not well formed. I have made a few interpolations when tracing the photos, and the photos are not ideal for getting a flat projection. Still, the various views of the helmet make this whole helmet suspect to my eye. I added the dashed line where I feel the fullest part of the skull should be. Without a stylistic comparison, it is hard to critique much further. I feel the chin is not well formed and the nape of the neck seems high. The latter is likely due to modifications of the lower collar lames. I'll keep my eye out for a comparison. This would not be much on an issue ... at least for me. The pits (not bubbles) regardless of how were formed, were apparently the pattern reverse of the metal used to forge the lames; naturally not equal to the fest of the helmet, as assumedly this in an addition provenant from another unit. I know, no more questions about that ... despite this was the reason i started this thread. Elmos in Portuguese... period. Concerning the skull shape, i can follow you by observing other helmets, like those in the Wallace Collection, although i get a bit lost at seeing some examples with a less 'ovoid back', probably because its geometry is more or less pronounced in connection with the drop to the width of the helmet base (neck opening). I notice that mine, if i rotate it it backwards, seems to have a bit less round shape ... or is it my eyes ?. 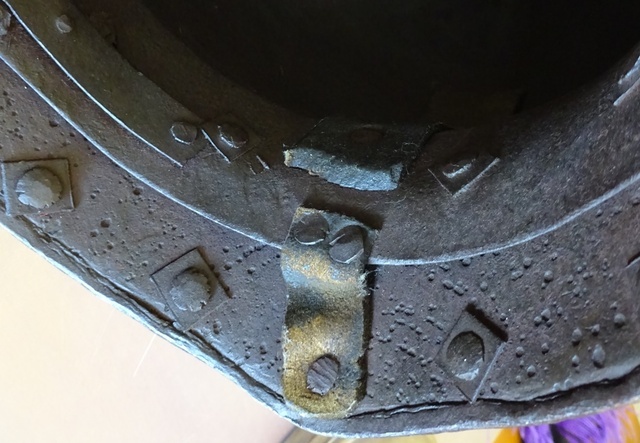 Could somehow this back shape be connected with some period fashion, or armourer forging fashion, or helmet style, namely by respective nation, or race; or is this only due for anatomic purposes in general ? . I have tried to put on my helmet but my ears get in the way; either i have a large head or the helmet skull is too narrow. On the other hand, taking apart the 'recent' visor replacement, would you say that all other additions and or alterations were put up in the period ... i mean, 16th/17th century ? Wouldn't be plausible that helmets suffered damage and had to be repaired by then, specially if they were owned by less wealthy owners ? As a reminder, I am not an expert. I have been to nearly every major western museum with an armour exhibit, but only as an enthusiast. Please don't take my interpretation of your helmet as anything but informed discussion and curiosity. I think putting that helmet on someones head will tell you a lot, but a good tracing of the cross section can also serve you. Were you to rotate the helmet as you describe I suspect two undesirable things would happen: The collar will lift up to expose more of the throat and the face opening will shift out of optimal alignment with the eyes and mouth. That is about all I can speculate on. It is a good test of general authenticity to know first whether an object will actually work on the human body. The second important consideration is to find some historical precedent for the style and detail of a piece. As I said before, the style of your helmet has me stumped. I am deeply recognized for your wise and experienced impressions. It takes some good judgement to define what an expert is. The person from whom i previously trusted the first comments on the photos of this helmet, an armourer well known for his prestige, besides his equivocal comment on the visor mounted on a legitimate helmet, as i previously quoted, had further stated in another occasion that such visor is a striking one. I assume his definition of striking was that of an asset and not that of a liability. 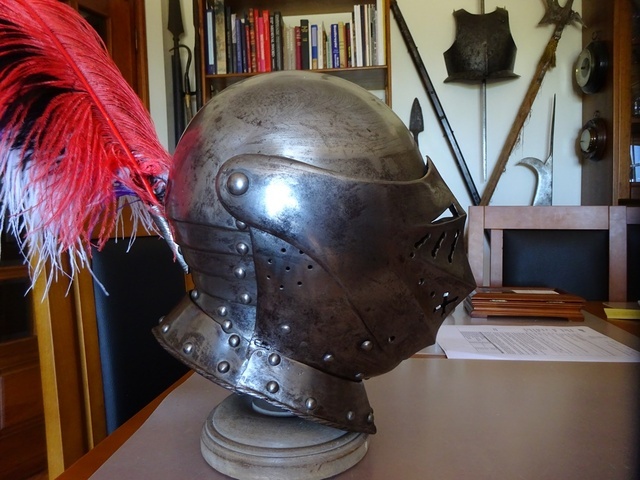 As i suddenly realized right after i submitted this thread with a basic idea to define the armet vs close helmet typology, assuming this was a legitimate example otherwise, i ended up opening a pandora box. Fernando, I have seen the inside of a lot of 15th/16th/17th century plate armour, and I have never seen 'pinholes' like that. Usually the inside looks 'rough' and 'lumpy' like old sandstone. I don't know what could make the iron look like that, but I think it must be modern iron or a modern process. 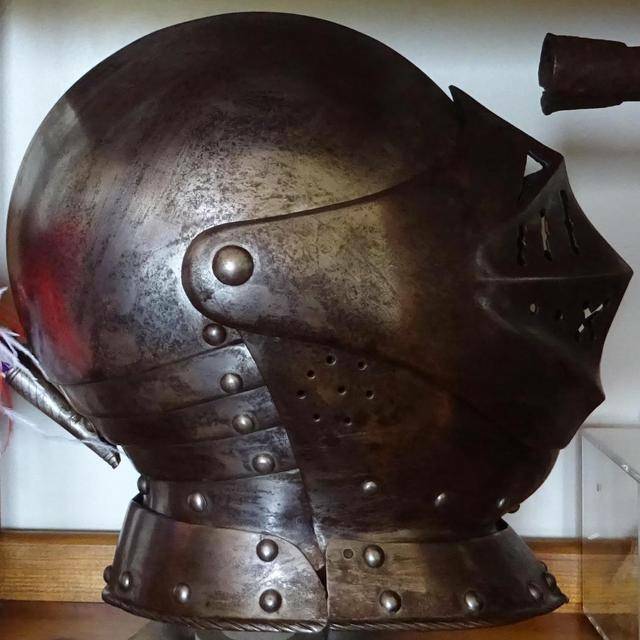 My guess is that most of the helmet is from the 16th century, but the visor and bottom lame at the front and back were made within the last 200 years, possibly by cutting up and re-shaping old armour. Duly noted, Sean. Thank you. In the meantime i thought there would be no need to remain with the visor slits good for an owner suffering of strabismus; so i had the local silver smith, a rather skilled artisan, to widen and square up the two holes.The difference is notable.